In the large scale water conservancy project, people pay more attention to the production of aggregate. 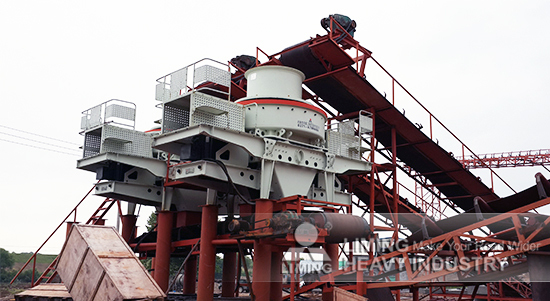 Developing new sand making process and adopting advanced sand making machine will improve the reliability of artificial sand production line. And the quality is good investment cost is reduced. For large scale water conservancy project, particularly the high intensity project with large amount of concrete, the artificial sand production line should separate from coarse aggregate in order to make the production management easier. And the process will be more stable. It is easy for independent production of artificial sand to realize intelligent control, and this way can also help to reduce production managers. The computer can monitor product quality on line and adjust some specifications comfortably. When the capacity of artificial sand production line is less than 200 t/h and the quality of stones exploited from artificial stone field is easy to control, we suggest dry process which can save investment cost and meet the requirements of environmental protection.